With Q2 2018 behind us, what we’ve witnessed so far is the continuous growth of ransomware attacks even as tech giants continue their push into cybersecurity market. According to a report from Check Point Software Technologies (NASDAQ:CHKP) issued in June the city of Atlanta which was hit by a ransomware attack in March, needs an additional US$9.5 million along with the initial estimated cost of US$2 million to recover from the damages. Further, an additional Check Point report said that ransomware is set to hit Google (NASDAQ:GOOGL) Play Store to achieve wide distribution. In its report, Check Point highlights a post from Kaspersky that said mobile ransomware has grown by over 250 percent in the first quarter of 2017. The company’s researchers detected a ransomware variant called Charger which is being tipped as the ‘early bird’. Check Point predicts the rise of mobile ransomware and urges users to secure their mobiles. The growth in ransomware comes on the heels of global tech giants expanding into the lucrative cybersecurity space which is tipped to be a trillion dollar market. On that note, as we head into Q3, here the Investing News Network (INN) takes a look back at Q2 2018 as to what the biggest trends in the sector have been so far and things to look forward in the upcoming quarters. In an email statement to INN, Steve Morgan, founder and editor-in-chief at Cybersecurity Ventures, said that the fact that ransomware continues to be a threat was one of the biggest takeaways of the quarter. 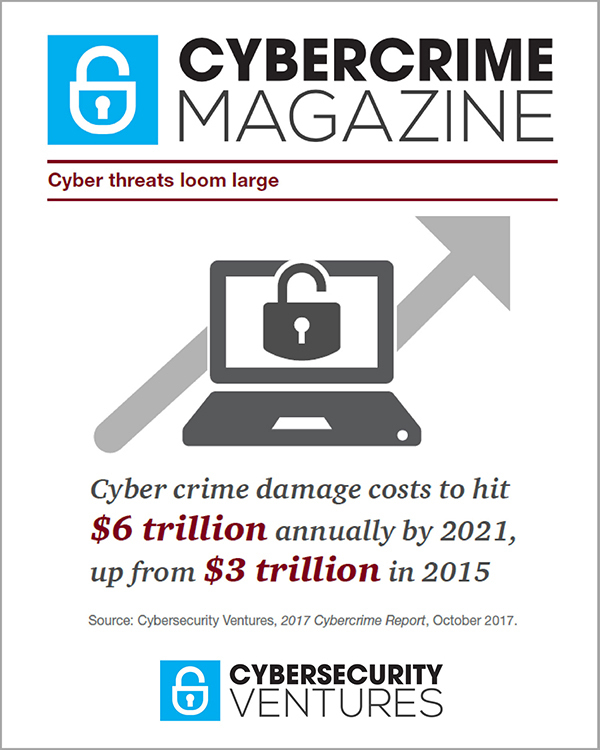 Case in point, in a June 2018 report issued by Cybersecurity Ventures, it is estimated that global ransomware damages for 2018 is expected to cross US$8 billion. “That is a steady rise from [US]$5 billion in 2017. Looking ahead, we expect ransomware damages to hit [US]$11.5 billion in 2019 – at which time ransomware will attack a business every 14 seconds (up from every 40 seconds in 2016),” Morgan told INN. Morgan said that the continuous growth of ransomware last quarter was surprising and pointed out that ransomware damage costs were only US$325 million in 2015. Several cybersecurity companies and research firms along with Cybersecurity Ventures have often pointed out that ransomware is “some of the easiest cyberattacks to circumvent”. Morgan said that the organizations can avoid ransomware attacks by training employees to detect phishing emails and scams. “And yet, we are still witnessing a cavalier attitude (we’ll take it more seriously if and when we get hit) that is resulting in substantial losses to businesses globally,” Morgan said. Morgan reiterated his comment of big tech vendors pushing into the cybersecurity market in this quarter and throughout the rest of 2018. Cybersecurity Ventures published its annual ‘Cybersecurity 500 list’ in Q2 for the year, , which Morgan said saw big vendors like Microsoft (NASDAQ:MSFT) and Amazon (NASDAQ:AMZN) making their way onto the list. Prior to that, the list generally consisted of big names like IBM (NYSE:IBM) andCisco (NASDAQ:CSCO) among other pureplay companies in the top 100. Further, Morgan said that the space will be buzzing with activity beyond this quarter, and the next. Looking ahead to the coming years, Morgan said that Cybersecurity Ventures predicts that more than 70 percent of all cryptocurrency transactions by 2021 will be for illegal activity. The firm estimates that currently 20 percent of five major cryptocurrencies or 50 percent of transaction using Bitcoin are used for illegal activity. Recent reports from various research firms including a recent post from job posting site Indeed have said that cybersecurity is hot space for jobs. Indeed’s post states that job searches in this space have increased by 5.7 percent while job postings have gone up by 3.5 percent. Further, Morgan said that over the next decade there will be an undercurrent that should make for a positive change in terms of jobs in this space. “The human capital problem is so dire in our space that we’ve woken up to the reality that we need major investments to plan and build for the future – to avoid a real hackerpocalypse,” he said. With ransomware on the rise and with the industry set to see huge investments from big tech vendors and from companies rising to the challenge in trying to prevent these attacks, the cybersecurity sector will be an interesting and exciting space for investors. For those wishing to jump into the sector, there are number of pureplay and big tech vendors who are involved in the space. For those who would invest in a market rather than a specific company, ETFs are a popular way to do so. Securities Disclosure: I, Bala Yogesh (author of this story at INN), hold no direct investment interest in any company mentioned in this article. The Investing News Network® (INN) publishes InvestingNews.com as a destination web site for the investment community. We provide independent, trusted news and education for investors in over 40 targeted categories. Cybersecurity Investing News, published by Investing News Network, is a trusted source for the cybersecurity marketplace, and a Cybersecurity Ventures media partner.